This book addresses the notion posed by Thomas Kilroy in his definition of a playwright’s creative process: ‘We write plays, I feel, in order to populate the stage’. It gathers eclectic reflections on contemporary Irish theatre from both Irish theatre practitioners and international academics. The eighteen contributions offer innovative perspectives on Irish theatre since the early 1990s up to the present, testifying to the development of themes explored by emerging and established playwrights as well as to the (r)evolutions in practices and approaches to the stage that have taken place in the last thirty years. This cross-disciplinary collection devotes as much attention to contextual questions and approaches to the stage in practice as it does to the play text in its traditional and revised forms. 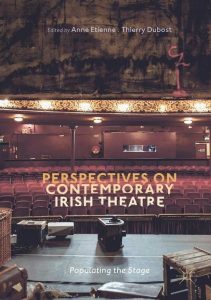 The essays and interviews encourage dialectic exchange between analytical studies on contemporary Irish theatre and contributions by theatre practitioners. Anne Etienne is Lecturer in Modern Drama at University College Cork, Ireland. She has published widely on theatre censorship in twentieth-century England, and is the main author of Theatre Censorship: from Walpole to Wilson (2007). She is currently expanding her work on Arnold Wesker. Her research in contemporary Irish theatre is devoted to Corcadorca Theatre Company.